Nowadays the expression “futuristic” seems to be quite abused, we can definitively say, looking at a specific development program in the aviation industry, that the Open Rotor makes a true exception to this marketing trend. In the case of Open Rotor demonstrator, the program developed by Safran Aircraft Engines through Europe's Clean Sky, is a real major step forward in the sector. First, because the turbofan traditional architecture is completely reinterpreted: this gas turbine engine is actually an evolution of the turbofan without a nacelle covering the front fan, but with two counter-rotating propellers. In order to understand such breakthrough architecture, a little refresh on a very important design parameter for aero engine is rather needed. Oversimplifying it, the bypass ratio is the ratio between the mass flow entering the fan (cool air) over the mass flow entering the core (hot air). The more cool air passes, the more efficient the engine performs in terms of fuel consumption while generating thrust. Commonly, this is why turboprops present lower fuel consumption with high bypass ratios. In the Open Rotor case the counter-rotating and unshrouded propellers meet two key challenges: reduce fuel consumption and minimize environmental impact by drastically lowering CO2 emissions. Usually, traditional turbofan engines are able to increase their bypass ratio increasing the fan (and consequentially the nacelle) diameter, but this cause also a weight and drag increase. Here is the game changer: a smaller nacelle and mostly the unshrouded fans (4 mt diameter) makes it possible to increase in bypass ratio improving energy efficiency of the engine. Some figures? The Open Rotor significantly increase in the bypass ratio to more than 30:1, which translates to a 30% fuel consumption compared to current turbofan commercial engines in service. Avio Aero is working with Safran Aircraft Engines and his partners since 2008 to develop ambitious technologies for this futuristic engine. Avio Aero is one of the partners, designing and producing – still inside the Clean Sky / SAGE 2 framework – the high-speed turbine and the power gearbox for the Open Rotor. The programme already reached several major milestones - including wind-tunnel tests in 2013 (when one of the most complex challenge, related to the noise generated by propellers counter-rotation was solved) - leading to the assembly of a demonstrator in 2016 and the start ground testing on the open-air test rig in May 2017. 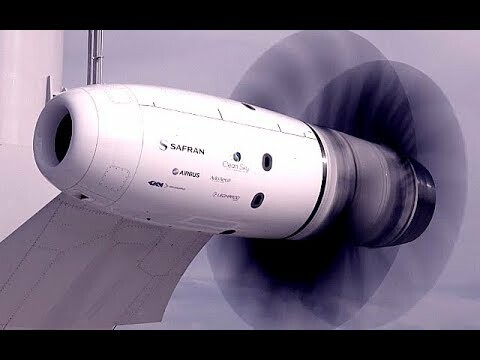 Clean Sky's goal is to prove open rotor architecture could be a valuable option to power the next generation aircrafts. The engine indeed is currently being tested in facilities at the French military base of Istres near Marseille and will continue until the validation of the demonstrator. Nevertheless, Avio Aero contribution did not end with the design and production phase. Right now Italian Engineers are teaming up with Safran and its partners supporting the testing activities in Istres. Matteo Usseglio, Principal Engineer for Turbines, is delighted to repeat that “admiring the majesty of engine running on test stand is the deserved rewarding moment for all the effort put in place to design and optimize the High speed Turbine. Requirements of this next generation architectures are really challenging and to meet them we had to put together our best technical skills, mixing technical know-how, optimization tools and innovative production methods, such as additive manufacturing”. Giuseppe Casamirra, the Design Engineer of the Transmissions, recalls that "today the SAGE2 Gearbox represents the most innovative architecture ever made in Avio Aero's history, making the project a real challenge that pushed the team to sharpen minds and to put in place the greatest creative thrust and analytical ability." With more than 100 years of history Avio Aero today is able to work 360° on an aeronautical engine. The current test phase is therefore another step in the long process of refinement that covers all elements of the project: not as something that is separate as stagnant compartments, rather something as one element, like in an orchestra. Each instrument performs its fundamental part. The concert has just started.